A superb centenary portrait of the unique Billy Eckstine (1914-1993), with all the most memorable recordings from his finest years. The always elegant 'Mister B' occupies a unique position among the top artists of his generation. Not only was his deep vibrato-laden baritone one of the most distinctive and popular voices of the era, giving sophisticated interpretations of romantic ballads that were quite unlike anyone else�s, but he was also a seminal figure in the development of jazz, and his big band of the time included a number of the most potent figures of bebop. 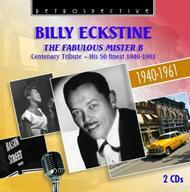 'The Fabulous Mister B' is Retrospective�s survey of Eckstine�s 50 finest during his vintage period of 1940-1961, beginning with tracks recorded as vocalist with the Earl Hines Orchestra (Jelly Jelly, Skylark...). Naturally, all four of his million sellers are included: A Cottage For Sale, Prisoner Of Love, My Foolish Heart and I Apologize, and his two big UK hits: No One But You and Gigi, together with many others of his solo hits of timeless classics such as Blue Moon, Body and Soul, If, Be My Love or Caravan. Six tracks are with his 1944/5 band that included jazz immortals Dizzy Gillespie, Art Blakey, Dexter Gordon, Gene Ammons, Fats Navarro and Sonny Stitt (Blowing The Blues Away...). It is fitting that four duets with the �divine� Sarah Vaughan should be featured, including the romantic classic Passing Strangers. The programme couples his artistry with many other fine musicians, such as Woody Herman (I Left My Hat In Haiti), George Shearing (Taking A Chance On Love), Count Basie (Little Mama . . .), Billy May (Stormy Weather...) and Quincy Jones (In The Still Of The Night), closing with six exciting examples of his live cabaret. And his talents went beyond singing. On Mister B�s Blues there is a rare chance to hear him playing valve trombone, while he takes up the trumpet on �Deed I Do'!